Cheim & Read is pleased to announce a survey of sculpture by Lynda Benglis from the mid-sixties to the present. A color catalogue with an essay by critic and curator Richard Marshall will accompany the exhibition. Arriving on the New York art scene in the late sixties with her poured latex and foam works, Benglis created a perfectly timed retort to the male dominated fusion of painting and sculpture that had taken place a few years earlier with the advent of Process Art and Minimalism. Known for her exploration of metaphorical, sexual and biomorphic shapes, she is deeply concerned with the physicality of form and how it affects the viewer, using a wide range of materials to render dynamic impressions of mass and surface: soft becomes hard, hard becomes soft and gestures are frozen. In Benglis' work, the act of artistic creation is embedded in presentation of process and the movement of materials. While this can be seen as a more formalistic pursuit, within Benglis' work it becomes an act of transformation, a sort of alchemical presentation in which material presence, with a life of its own, combines with artistic manipulation as an extension of the body. Throughout her career, Benglis has managed to balance controversy with critical interest, abstraction with content, and gesture with mass, creating a diverse body of work known for its formal and innovative qualities. The artist's influence can be seen in the work of many younger artists working today; examples include the plastic "blobs" of Roxy Paine, the sexually suggestive props of Matthew Barney, the floor pieces of Polly Apfelbaum and the ambiguous shapes created by sculptor Franz West. The exhibition begins with Benglis' early poured latex and dripped wax pieces, work that transposed the easel tradition questioned in Abstract Expressionism into an actual environmental exercise – extending Pollock and presaging Warhol's piss paintings. 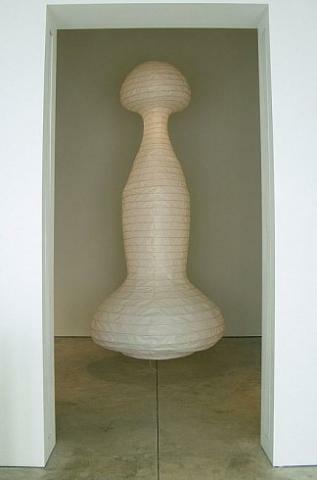 In, BIKINI INCANDESCENT COLUMN, the most recent work in the exhibition, Benglis creates a fourteen foot high light sculpture that makes sly allusions to both feminine curves and the phallic shape of the atomic bomb tested on Bikini Island, an example of Benglis' ability to combine her formal interests with social and political content. Lynda Benglis was born in Louisiana and now resides in New York and Santa Fe. She is the recipient of a Guggenheim Fellowship and two National Endowment for the Arts grants, among other commendations. In recent years Benglis' work has been exhibited at the Tate Modern, The Museum of Modern Art and the Whitney Museum.